Transported from Vlissingen in the Netherlands to Oxfordshire for installation at Harwell Campus. SLS were approached by STFC and asked to propose a solution to moving oversize cargo from Holland to Harwell, Oxfordshire in the UK. The consignment was a sophisticated vacuum chamber for testing equipment and satellites prior to being launched into space and required careful handling. This enquiry grew into a project that not only involved moving the cargo from Vlissingen in Holland, but also assisting the manufacturer’s engineers in installing the chamber into the client’s specially commissioned facility at its destination in Harwell. Working in this ‘clean environment’ meant that the tiniest scratch to the floor or walls could produce dust particles that would lead to extensive cleaning and a potential delay to the start of the testing programme – yet another challenge to be overcome. The operation included producing route surveys in both the Netherlands and the UK in order to confirm that the movement was possible, contact with various government agencies and the police. It also included pre-arrival planning with engineers, creation of a work plan, hiring-in all the necessary plant and equipment including mobile cranes, fork lifts and access equipment to assist with the build and installation, finishing off with laser positioning and levelling of the assembled unit. At 6m long, 5m in diameter and weighing 44 tonnes, this is one of the largest vacuum chambers in Europe. Needless to say, these dimensions presented their own problems – just negotiating the entry into and the path through the building was a challenge in itself. With barely millimetres to spare, SLS ensured perfect positioning of the chamber in readiness to begin a programme of instrument testing for the European Space Agency. Months of planning ensured that everything went smoothly, achieving one of the highest commendations ever received from a customer. 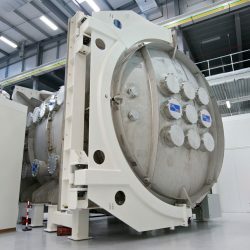 Such was the client’s satisfaction with the project outcome that SLS were invited to transport a second chamber from Spain and install this larger Thermal Vacuum Chamber at the Rutherford Appleton Laboratory, just outside Oxford. Also designed to test satellites and associated instruments destined for space missions, amongst other operations it can replicate temperature variations of -180˚C to + 150˚C.